After the testimonies of the Civil Guard, it was time in this seventh week of the trial for the international observers and Lieutenant Coronel Baena, whom had been accused by the defense of having a Twitter account from which messages against the Independence movement had been published. The forcefulness of the testimonies that took place this week is making apparent the differences between the points of view and the strategies of the defenses. Melero remains focused and following his line of trying to attest the operational independence of the Mossos and thus that Forn did not take part in the events of the 20th of September and 1st of October. He acted intelligently when he protested, during the testimony of Lieutenant Colonel Baena, for his depiction of the period between 20-S and 27-O as “insurrectional”. While Judge Marchena accepted that it was a term with an important connotation, he stated that the Court would assess the facts with their own criteria despite the subjectiveness of the witness. On the other hand, other defenses seem to be in some kind of disarray over the result of the testimonies, facing the interrogations with a flamboyant court behavior. In the first place, the defenses are repeating ad nauseam their requests to play some video proof during the testimonies, protesting each and every time that the President of the Court denies the request. The Law of Criminal Trial Procedure defines from its article 688 onwards the “procedure of presentation of evidence in the oral trial” and sets a clear order for its execution: the testimonies of witnesses are taking place now, later it will be the turn of the testimony of technical experts and finally all the documentation, including videos, will be presented. The contradictions, if they happen, must be highlighted by the lawyers in their final report, and the Court will assess them following the rules of a healthy criticism. That’s why there is no infringement whatsoever of the right of defense and the protests, as Marchena says, are just playing to the gallery: It is in the final report that the lawyers have the chance to point out contradictions, if any. Even more bizarre is the insistence on interrogating the witnesses about the reports of the Judicial Police, the circumstances in which they were elaborated or the facts stated in them. The Court, precisely as guarantee of the principles of contradiction and immediacy, has clearly stated from the very beginning that will not consider as proof anything not happening in the plenary, and in particular that the reports have been useful during the investigation, but are no longer valid. This is a strict criterion about the value as a proof of the reports that guarantees the right of defense. The President of the Court has already mentioned that the repeated attempts of interrogating the witnesses about the reports are just a waste of time. The stubbornly insistence from some of the defenses looks more of an attempt to move the focus away from the effectiveness of the testimonies being given before the Court. On Wednesday, after Pine invoked the “law of rites”, Marchena asked him not to use that term, which he considered “an insult to the processalist lawyers”. Law of rites is a term originated in the nineteenth century, when the administration of justice was nothing but the application of some ritual formulae. It was the age of the proceduralism or formalism, in which the law of rites was just a formal appendix of substantive law. From the middle of the twentieth century onwards, with Windscheid and Chiovenda, appears the concept of due process and procedural law as a discipline on its own. For this reason, the warning from Marchena seems to exceed a matter of terminology, and it is a way to draw attention to the need to abandon the formalist protest played to the gallery and focus on the subject of the trial. 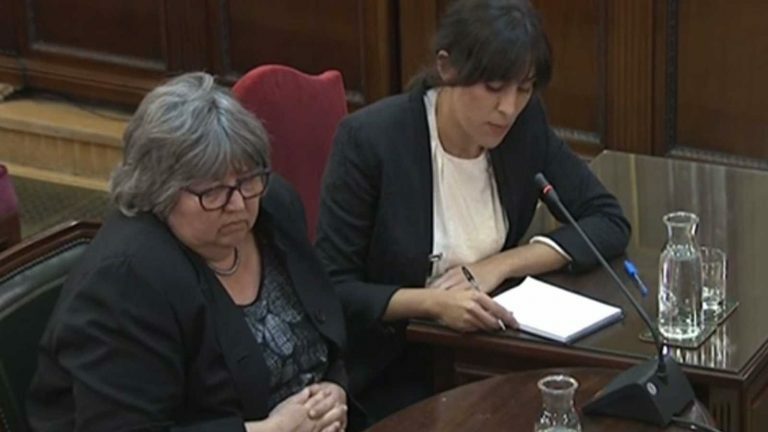 Among the testimonies of the wee, one specially clarifying was that of Ms. Helena Catt, not only about the increasingly solid accusation of malfeasance, but also about the level of the international experts used by Diplocat for their external propaganda. Ms. Catt was the head of a group of pro-secessionist observers named International Election Expert Research Team, who produced a report after the 1st of October, in which literally the results of the vote on that day were validated, also stating that the observers were astounded to have witnessed a military-style operation conducted against a pacific and democratic process. A few days ago Albert Royo, former secretary general of Diplocat, was interrogated and he denied that he had contracted and payed observers for the 1-O, arguing that there had been a visit of a group of political sciences experts that happened to be in Catalonia on those dates. The testimony of Ms. Catt solidified even further the proof of malfeasance through the incisive interrogation of the Attorney of the Estate, during which she confessed receiving 8.000 euros from Diplocat, as well as attesting that the other 17 members of the team had also received remuneration. The methodology for learning about the referendum consisted on reading electoral leaflets and taking part in clandestine meetings with unidentified people that provided briefings about the referendum after being invited from an email account named “[email protected]”. To top it all, and despite stating that the subject of their visit was not as much the referendum itself but its context, she denied having notices about the events on 20-S. Such was the level of the observers that validated the results of 1-O. This week we have learnt a piece of news whose significance might have not been noticed: the prosecutor of the Court of Accounts has requested to initiate legal action against Puigdemont on the grounds of misuse of public funds to finance the referendum on 1-O. When the formal accusations were published, there was some controversy because the Attorneys of the Estate did not demanded the civil liability derived from the charges of malfeasance, but relied instead on the corresponding procedure of accounting responsibility before the Court of Accounts. In that moment there were suspicions of dark motivations and dealings under the table. Far from that, since it is what the law specifies. Article 18.2 of the Organic Law 2/1982 of May 12th on the Court of Accounts, states clearly that “When the events are part of a offense, civil liabilities will be determined by the accounting jurisdiction in the scope of its authority”. It is an Organic Law, perfectly capable of ruling over the assignment of fields of responsibility between different jurisdictions, just like the Organic Law on the Judicial Power. That is, if an offense of misuse of public funds is committed by someone charged with its management (public authority or public servant), the civil liability derived from this offense must be settled in the corresponding procedure before the Court of Accounts. Therefore a Criminal Court might set a ballpark figure of this liability only for the purpose of imposing the basic or the aggravated penalty, which depends on a threshold on 250.000 euros according to article 432.3.b) of the Penal Code.